PHILADELPHIA - J.D. Drew continues to amaze - if he keeps hitting like this, how will Terry Francona find a spot for David Ortiz when Big Papi comes back? - and confound (is this really the same guy who went 50 games and 192 plate appearances between home runs last season?). The Red Sox, meanwhile, continue to blow up one notion - they can't win on the road - while bolstering their case for another - they don't lose to National League teams. And Drew is only part of that equation. Drew dazzled with his bat again in yesterday's 7-4 win over the Phillies, hitting his seventh home run in his last 11 games while matching his career high with four hits. He laughed when someone asked in jest how Ortiz will like hitting sixth when he returns, now that Drew has supplanted him in the 3-hole. "Y'all can bring that up to him," said Drew, hitting .441 with nine home runs and 21 RBIs since Ortiz hurt his left wrist in Baltimore May 31. "Let them figure it out." But in taking two of three in both Cincinnati and Philadelphia in this six-game excursion to NL venues, the Sox' pitching staff can't be shortchanged for the job it did in two of baseball's certified squeeze boxes. Sox pitchers allowed just 19 runs in six games against the Phillies - who were tied with the Cubs as the NL's highest-scoring team and lead the league in homers at home with 56, including the three they hit off Bartolo Colon in winning the series opener Monday - and the Reds, who have the game's only active 600-homer man, Ken Griffey Jr.
Josh Beckett and Jon Lester both started shutouts, Beckett in Cincinnati, Lester in Philadelphia. Jonathan Papelbon collected saves in the last two games here. Craig Hansen picked up his first big league save in Cincinnati. And Manny Delcarmen was money yesterday in the seventh inning, the only time all afternoon the game threatened to turn dicey. "Tito keeps giving me the ball and putting me in those situations," said Delcarmen, who happily embraces pitching out of jams like the one he inherited yesterday, Hansen having just surrendered a two-run single to pinch hitter Pedro Feliz to make it a three-run game. Delcarmen brought the tying run to the plate when he walked Jimmy Rollins on a full count, but proceeded to set down Shane Victorino on a pop and Chase Utley on a line out before throwing a 96-mile-per-hour fastball past slugger Ryan Howard, the pitch hitting Jason Varitek's glove exactly where he'd set it, on the outside corner. Then Delcarmen breezed through a 1-2-3 eighth before Papelbon picked up his 21st save. "Things happened a little quick," Francona said. "But Delcarmen was terrific. He slowed the game down." By taking the rubber game here on a day Mike Lowell followed Drew's three-run home run in the first with his 11th home run - the major league-leading ninth time Boston has hit back-to-backers (six times in the last 17 games) - the Sox are 7-2 in interleague play this season, 35-10 against NL opponents since the start of 2006. They won without Manny Ramírez (hamstring again), Kevin Youkilis (back spasms), and Coco Crisp, who came out after feeling pain on the top of his left hand after a first-inning swing. Rookie Brandon Moss hit for Crisp with the bases loaded in the third, a rally started by Drew's double, and delivered a two-run single. Delcarmen's emergence as a stopper has given the Sox a viable option while Hideki Okajima seeks to regain the dominance that made him one of the most valuable components of the '07 champions. In his last 16 appearances, since he gave up a couple of runs to the Rays May 4, Delcarmen has allowed just two earned runs in 18 innings, an ERA of 1.00. He has 15 strikeouts in that span against just five walks, and yesterday was the 10th time in that stretch he has pitched in the eighth inning or later. Francona suggested that Theo Epstein personally delivering a vote of confidence helped Delcarmen shed the memories of a rocky start this spring. "Theo said, 'Take a deep breath, we're going to keep relying on you in key innings,' " Francona said. 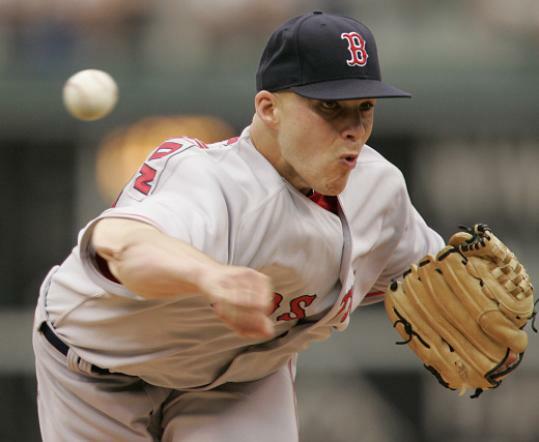 Rookie Justin Masterson, meanwhile, is delighted the Sox shelved plans to return him to the minors, electing to place Colon on the 15-day disabled list with a conveniently timed lower-back strain. Masterson labored a bit more than he had in his previous five starts, throwing 92 pitches in an outing abbreviated after five innings, but he yielded just two runs, on an RBI single by Howard in the first and three singles in the fifth, and is now 4-1. It was Boston's good fortune that Utley, an early favorite in the NL MVP race, had a miserable series, going 0 for 13 and hitting just two balls to the outfield. Combining that with Griffey's 0 for 10 in Cincinnati, Sox pitchers held opposing No. 3 batters hitless in 23 at-bats - which, coincidentally, matched the 0 for 23 put up by the No. 9 spot in the Sox' order, Boston pitchers collectively going 0 for 17 with 12 whiffs. "I shouldn't have changed my stance," said Masterson, who whiffed in all three of his at-bats while adopting more of a crouch than he'd used in batting practice. Francona said Masterson's inconsistent arm slot led to his struggles with command. Masterson arrived at the same conclusion after looking at video in the clubhouse. "I wasn't looking at this one as my last [start]," said Masterson, who appeared on the verge of being sent back with Daisuke Matsuzaka coming off the DL to start Saturday against the Cardinals. "I approached this as another start where I had to do my part. "I would have liked to have been more consistent, but you have those days where you need your offense and defense to pick you up, and that's exactly what they did." Especially Drew, having the month of his life when the Sox have needed it most. "His timing," Francona said, "is impeccable."